2 About Our Services We are Independent Financial Advisers (IFA s) working in partnership with you to devise comprehensive solutions to your financial and insurance requirements. 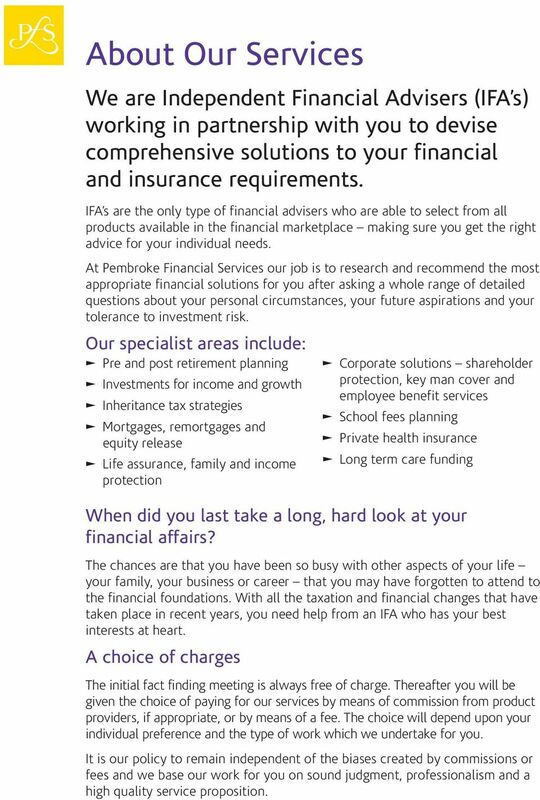 IFA s are the only type of financial advisers who are able to select from all products available in the financial marketplace making sure you get the right advice for your individual needs. 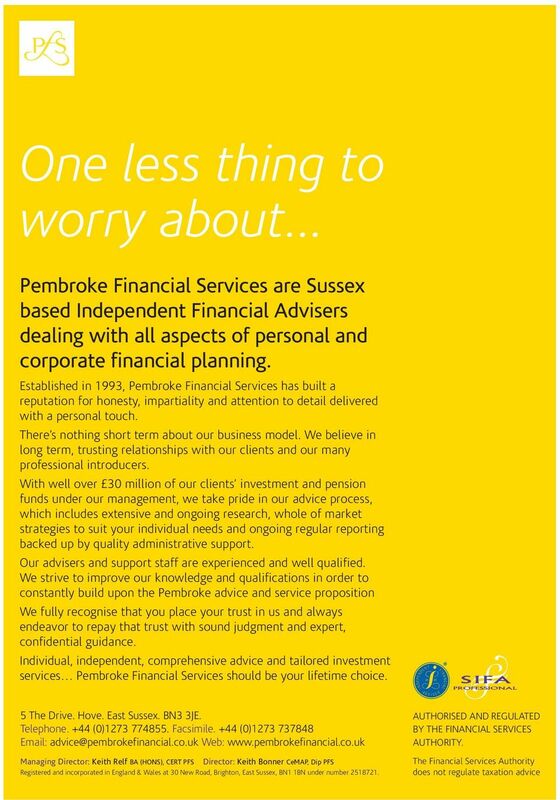 At Pembroke Financial Services our job is to research and recommend the most appropriate financial solutions for you after asking a whole range of detailed questions about your personal circumstances, your future aspirations and your tolerance to investment risk. Our specialist areas include: q Pre and post retirement planning q Investments for income and growth q Inheritance tax strategies q Mortgages, remortgages and equity release q Life assurance, family and income protection When did you last take a long, hard look at your financial affairs? The chances are that you have been so busy with other aspects of your life your family, your business or career that you may have forgotten to attend to the financial foundations. With all the taxation and financial changes that have taken place in recent years, you need help from an IFA who has your best interests at heart. A choice of charges q Corporate solutions shareholder protection, key man cover and employee benefit services q School fees planning q Private health insurance q Long term care funding The initial fact finding meeting is always free of charge. Thereafter you will be given the choice of paying for our services by means of commission from product providers, if appropriate, or by means of a fee. The choice will depend upon your individual preference and the type of work which we undertake for you. It is our policy to remain independent of the biases created by commissions or fees and we base our work for you on sound judgment, professionalism and a high quality service proposition. 3 Pre & post retirement planning When it comes to providing for retirement too many people are doing too little too late. Putting away even a small sum early on can make a big difference to the lifestyle that you will enjoy when you retire. Modern pensions continue to benefit from exceptional tax breaks. 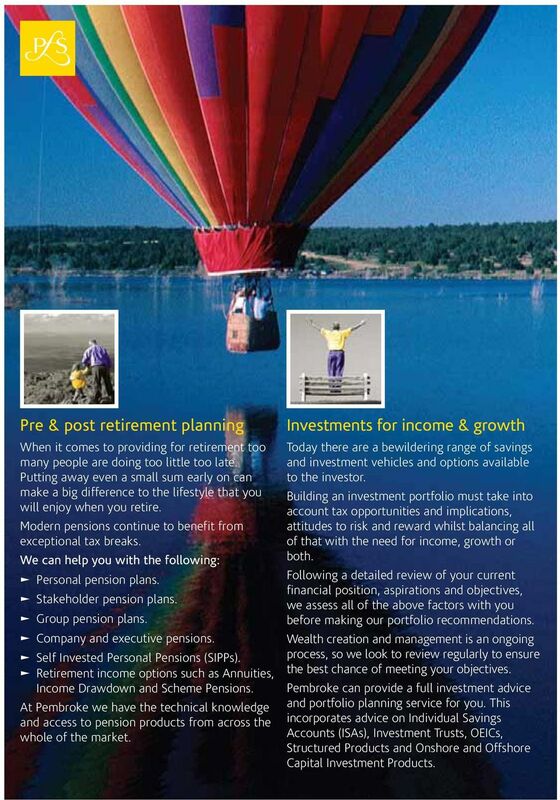 We can help you with the following: q Personal pension plans. q Stakeholder pension plans. q Group pension plans. q Company and executive pensions. q Self Invested Personal Pensions (SIPPs). q Retirement income options such as Annuities, Income Drawdown and Scheme Pensions. 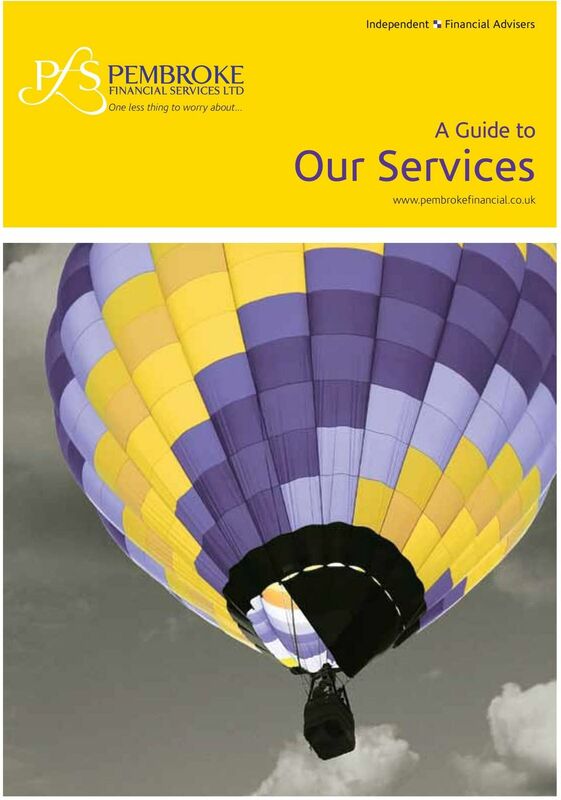 At Pembroke we have the technical knowledge and access to pension products from across the whole of the market. Investments for income & growth Today there are a bewildering range of savings and investment vehicles and options available to the investor. Building an investment portfolio must take into account tax opportunities and implications, attitudes to risk and reward whilst balancing all of that with the need for income, growth or both. Following a detailed review of your current financial position, aspirations and objectives, we assess all of the above factors with you before making our portfolio recommendations. Wealth creation and management is an ongoing process, so we look to review regularly to ensure the best chance of meeting your objectives. Pembroke can provide a full investment advice and portfolio planning service for you. This incorporates advice on Individual Savings Accounts (ISAs), Investment Trusts, OEICs, Structured Products and Onshore and Offshore Capital Investment Products. 4 Mortgages, remortgages & equity release For most people, your home will be the largest single investment you will ever make, so making the wrong decision can become a very expensive mistake. Taking the wrong mortgage can end up costing thousands extra over the lifetime of the loan and what appears to be the cheapest on day one will not always prove to be so in the long run. To add to the confusion there are now a bewildering number of mortgage types. Pembroke can provide detailed guidance on buying a property and looking for the right type of mortgage. Our advice covers not only property purchase, but also remortgages, Equity Release and Commercial mortgages. Your home may be repossessed if you do not keep up repayments on your mortgage. Life assurance, family & income protection There are many forms of life assurance. Choosing the right one for you can depend on a number of factors including cost, tax and the level of protection you need. Only expert, independent advice after a full review of your circumstances, can ensure that you find solutions to protect your family, your business and your income. In certain circumstances, protection can be arranged in such a way as to minimise the long term effect of Inheritance tax. Inheritance tax strategies None of us like to think too much about dying, yet it is important that we plan ahead to ensure that our families and dependents are not left in financial difficulty when it does happen. 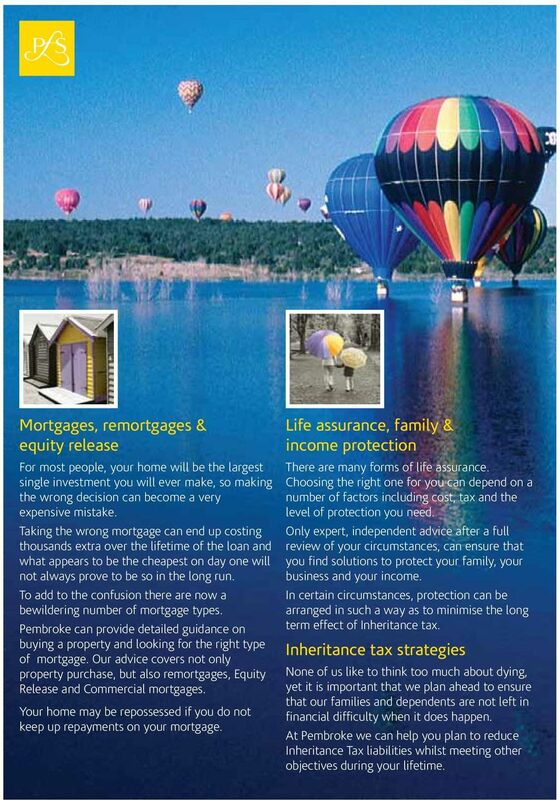 At Pembroke we can help you plan to reduce Inheritance Tax liabilities whilst meeting other objectives during your lifetime. 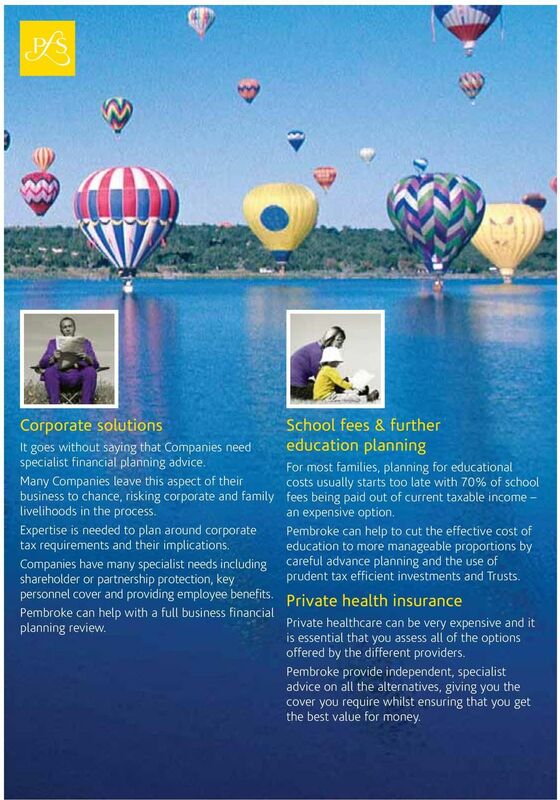 5 Corporate solutions It goes without saying that Companies need specialist financial planning advice. Many Companies leave this aspect of their business to chance, risking corporate and family livelihoods in the process. Expertise is needed to plan around corporate tax requirements and their implications. Companies have many specialist needs including shareholder or partnership protection, key personnel cover and providing employee benefits. Pembroke can help with a full business financial planning review. School fees & further education planning For most families, planning for educational costs usually starts too late with 70% of school fees being paid out of current taxable income an expensive option. Pembroke can help to cut the effective cost of education to more manageable proportions by careful advance planning and the use of prudent tax efficient investments and Trusts. Private health insurance Private healthcare can be very expensive and it is essential that you assess all of the options offered by the different providers. Pembroke provide independent, specialist advice on all the alternatives, giving you the cover you require whilst ensuring that you get the best value for money. 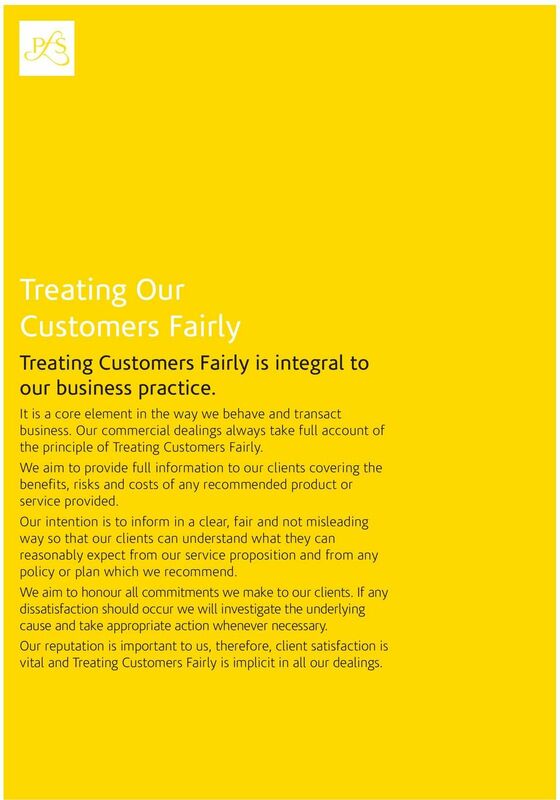 6 Treating Our Customers Fairly Treating Customers Fairly is integral to our business practice. It is a core element in the way we behave and transact business. Our commercial dealings always take full account of the principle of Treating Customers Fairly. We aim to provide full information to our clients covering the benefits, risks and costs of any recommended product or service provided. Our intention is to inform in a clear, fair and not misleading way so that our clients can understand what they can reasonably expect from our service proposition and from any policy or plan which we recommend. We aim to honour all commitments we make to our clients. If any dissatisfaction should occur we will investigate the underlying cause and take appropriate action whenever necessary. Our reputation is important to us, therefore, client satisfaction is vital and Treating Customers Fairly is implicit in all our dealings. 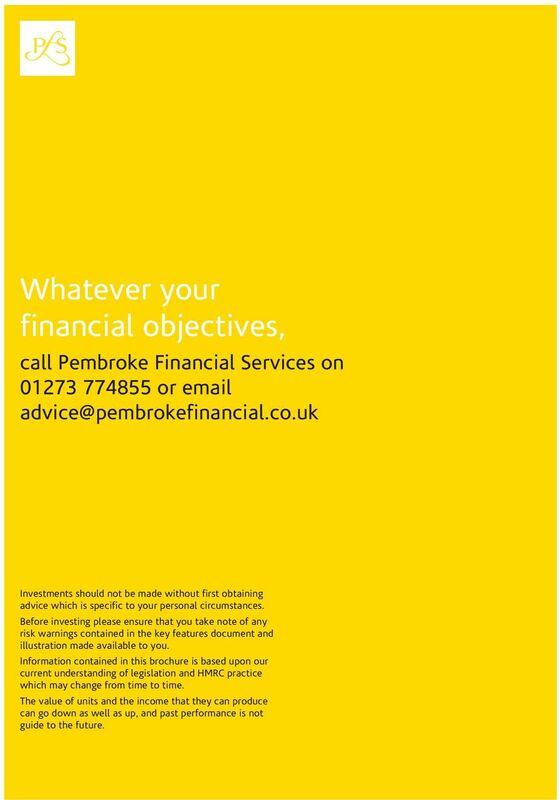 7 Whatever your financial objectives, call Pembroke Financial Services on or Investments should not be made without first obtaining advice which is specific to your personal circumstances. Before investing please ensure that you take note of any risk warnings contained in the key features document and illustration made available to you. Information contained in this brochure is based upon our current understanding of legislation and HMRC practice which may change from time to time. The value of units and the income that they can produce can go down as well as up, and past performance is not guide to the future. Financial Planning. www.watermark-financial.co.uk. Life Changes. Make sure your finances are protected. A warm welcome to the first edition of the Ashtree Financial Services Newsletter. Ashtree Financial Services is part of the Autoline Insurance Group OCTOBER 2011 Ashtree Financial Newsletter - Issue 1 A warm welcome to the first edition of the Ashtree Financial Services Newsletter. It s not how much money you make, but how much money you keep, how hard it works for you, and how many generations you keep it for.